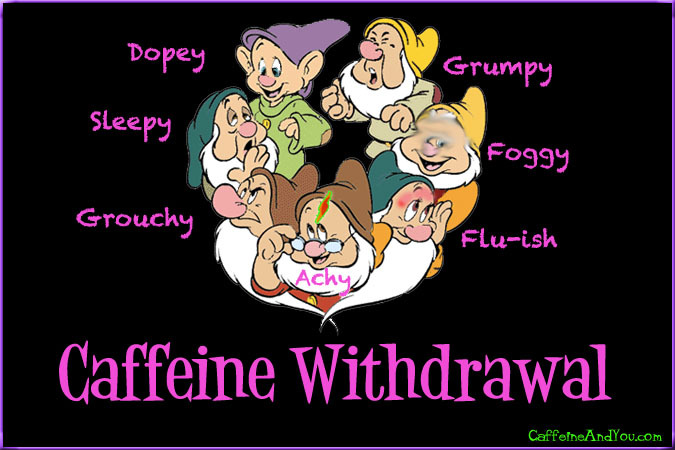 You are here: Home / Caffeine Basics / Caffeine Withdrawal Symptoms: Ouch! If the world’s supply of caffeine suddenly dried up, we’d have a global headache on our hands – literally. Most of our heads would be pounding. Throngs of us would feel grumpy, dopey, sleepy, grouchy, achy, depressed, or all of these. In other words, we’d be suffering from Caffeine Withdrawal Syndrome. Caffeine Withdrawal Syndrome was added in 2013 to The American Psychiatric Association’s Diagnostic and Statistical Manual of Mental Disorders. But why? Apparently, people were experiencing symptoms, but doctors and patients weren’t identifying caffeine – or rather caffeine cessation – as the cause. Misdiagnoses can include flu, sinus problems, medication side effects, migraines and more. The symptom checklist helps pinpoint when caffeine, and not some other condition, might be the reason a patient is feeling so bad – bad enough to disrupt normal functioning in daily life. Or the patient may have more ambiguous feelings, like being less motivated at work or less social than normal, and these feelings can be mild or severe. Fortunately, the symptoms do go away. They peak after about a day or two, but some can last up to nine days and the headaches can occur for as long as three weeks. Ouch! Have you ever had to give up caffeine for a day or more? Hospital procedures, traveling, going to war (or to jail), being pregnant, fasting, religious practices – any sudden break from your caffeine routine can cause real problems in how you feel and behave. We don’t think of daily caffeine use as being an addiction, partly because it’s so widespread. Yet symptoms of caffeine withdrawal happen as quickly as overnight (when we crave our first cup of coffee or tea). If you really want to cut out the caffeine, experts say the best way to quit is slowly. Taper off the dosage and the frequency. Give your system a chance to adapt. Even just a fraction of your normal dose, say a half-cup of coffee vs. the usual 2 cups, can be effective in stifling symptoms. And about those headaches…read the ingredients label before popping a painkiller; many painkillers include caffeine for its analgesic effects. If you take Excedrin, for instance, you may blunt the pain, but you’re still ingesting caffeine.